Garlic Butter Asparagus with Crispy Parmesan has so much flavour! The perfect crispy and crunchy side dish OR snack! Topped with a buttery Panko crumb mixture with parmesan cheese and garlic, then roasted and broiled (or grilled) until deliciously crispy with SO MUCH FLAVOUR. Even the pickiest of eaters will LOVE this recipe! Preheat the oven to 400°F (205°C). Lightly grease a baking tray or sheet with non stick cooking oil spray. Place the trimmed asparagus in a bowl. Add the rest of the ingredients and use your hands to evenly coat onto the asparagus. 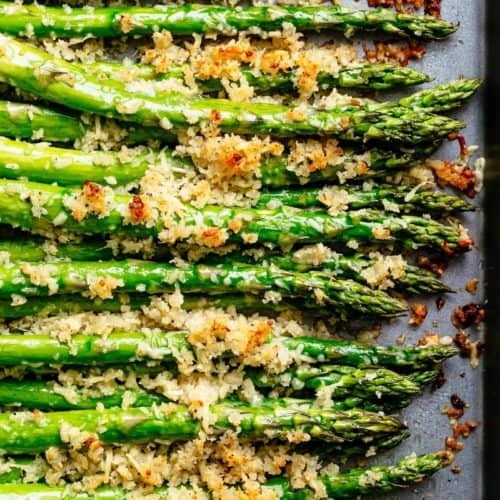 Transfer the asparagus and breadcrumb mixture onto prepared baking sheet and arrange into one even layer. Bake for about 10 minutes, or until the asparagus are just tender. Broil/grill for 2-3 minutes until breadcrumbs are golden browned and asparagus has reached desired doneness.